I love a good vacation to the beach; sun, sand and plenty of seafood restaurants nearby! Of course, thats probably not all you need. Sunblock, beach towels, books and magazines, toys for the kids, a bottle of water and maybe an ipod are all neccessities for a fun and safe trip to the beach. These sundry items add up and need to be carried in something! Beautiful tote bags flood the market this time of year but make sure you get one that is machine washable and large enough for everything you'll need (and stylish to boot of course!). 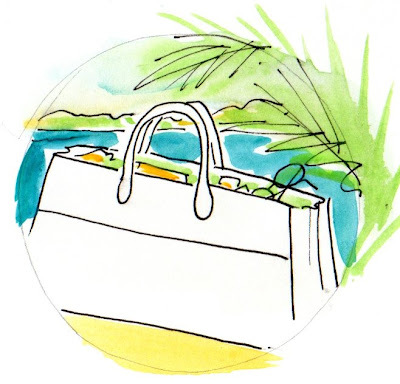 I always prefer a tote with a zipper enclosure so that nothing falls out on the trip to the beach; preferably with lots of pockets for organization so you know where to find everything. 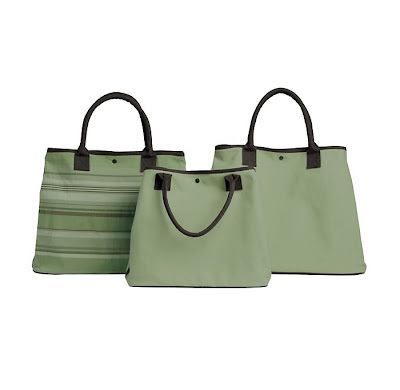 Restoration hardware currently has a really useful and stylish tote on clearance in many colors that can also be monogrammed. If you're still looking for a beach bag, this may be the one HERE; Leaves more money for the bathing suit! After our bags are taken care of and the flight is underway, we can take out our books, lean back and relax. If we're lucky we can fly first class and have all the comfy leg room and champagne a long trip requires (especially the champagne!). 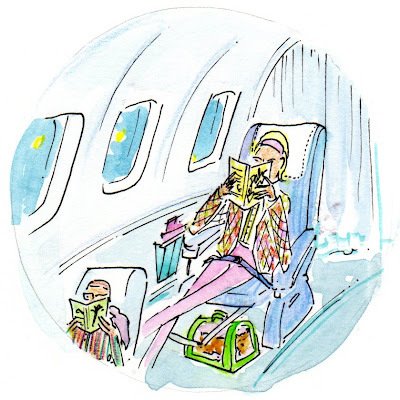 Here a chic traveler reclines in her single-loaded seat with her little dog nestled comfortably under her feet: The stewardess brings refills without having to be asked and warm, scented washcloths. We can just enjoy the view and our favorite magazine. Ahhhhh.......... Who wants to land when we have this kind of service! Patricia left me a series of 6 beautiful new illustrations and I'm so pleased to be able to put my spin on them for you! I'll present these as a little story in the next few days all about the art of traveling. After the tickets are bought and reservations made, one's mind will first veer towards packing. Of course, in the past one would always have a beautiful hard-backed suitcase like these to travel in style and protect one's clothes from wrinkling. 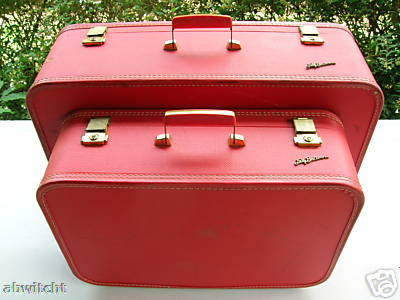 Find a vintage hard-backed suitcase to travel in style; Check out ebay, local thrift stores or auctions. I hate to check luggage and always travel with an olive and tan leather Italian duffle that I always get compliments on. I feel confident that it's stylish and also practical! Reading materials are probably as important as a toothbrush. Where would we be without either (smelly and bored is where!). 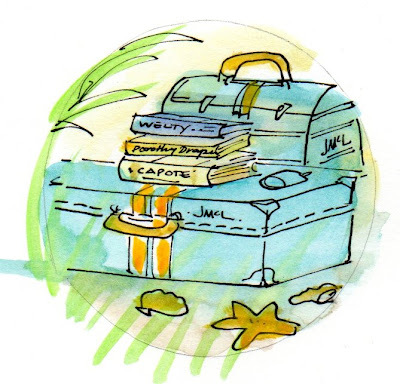 Here Patricia chose some books by Capote, Dorthy Draper and Welty. I always like to bring along a few of my favorite design magazines and a New Yorker, too. This looks like the beginnings of a great trip to me! Follow along with me in the next few days to see how this trip progresses. 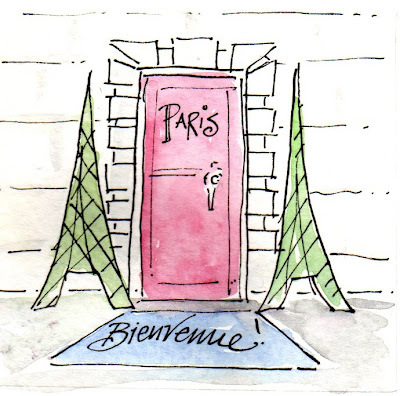 Please welcome "Architect Design" blogger to step in to fill my blogging shoes while I travel to Paris. I immediately thought of him, knowing how much he loves architecture and France. I sent him many illustrations having to do with the "art of travel." I know that he will do an incredible job for me and I am in hopes that something special will find it's way from my travels to bring back to him for his time, his style and his dedication to blogging. 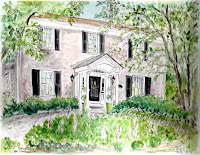 Architect Design was inspired to blog daily, by none other than Style Court and Peak of Chic. He was born with an eye for style, design and has a flair for finding the most inspiring photos. Although we have never met, we are connected with our love for design. Promise to come back with lots of inspiration! I save lots of things that inspire me. I have files for many of my tear sheets to refer to. One file is titled, "Party File" - yes, it is true people, that I am crazy enough to have files dedicated to Parties. From the time I was a young thing, I would tear out pictures that I liked and save them. I never needed the recipe or instructions, the picture would suffice just the right image! Parties ranging from wee tots birthdays to over the hill parties. I save them all. 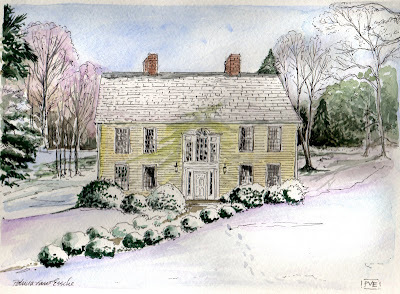 Open House to Holiday gatherings, Family re-unions to the most intimate dinners. Celebrations with a personal touch always excite me. People say, "You make it look so easy!" It is easy when you have a vision or a plan of how you see it. Lucky for me that my files always provide me with a "go to" spot. I even have a "Hair File" to take to the salon which my stylist loves! One day, I decided to organize all the photos in to files and binders to have at the ready. They really are useful when I am illustrating something or need to be inspired." a healthy birthday party, tissue paper carrot wrapped favors! Nothing excites me more than planning a party and knowing that I am not alone in this passion. What is your favorite part of planning a party? What is the best party that you have ever been to or hosted? If you have a pool, then you have the perfect setting for a "pool party!" When I was in my teens, my parents put in an in ground swimming pool and suddenly our home became the party spot or gathering place for family and friends. 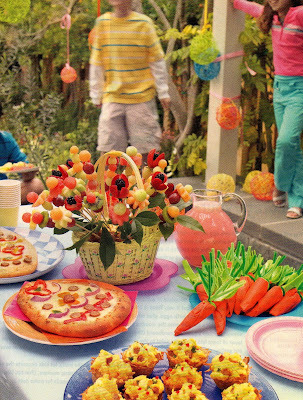 I have fond memories of making fresh fruit salads, ice tea and our yellow and white pool furniture. Do not despair, if you do not have a pool, think of a small blow-up inflatable pool for a children's party. Serve ice pops, lemonade and fresh watermelon. Turn on the sprinkler and let the kids have some fun. Add hoola-hoops, water balloons and you will surely see smiles. Even grown-ups will want to run through the sprinkler! A patio is a perfect spot to hold a summer's eve cocktail. 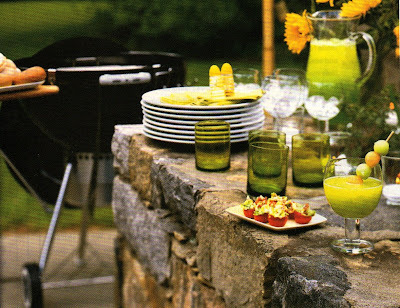 Entertaining outside is a great way to embrace your inner "courtyard" and liven up your terrace or patio with accessories to bring about an island soiree. Palm trees, fountains, and lattice work can easily be added to transform a space from drab to delightful. Torches to add light as well as strings of lights are a wonderful way to add ambiance, and extra light when the sun goes down. 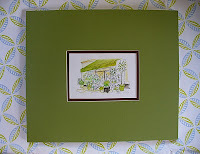 Events can be tied to a gallery opening, or for a worthy cause on a patio, terrace, deck or sun-roof! Posting this week shall be dedicated to Summer parties. 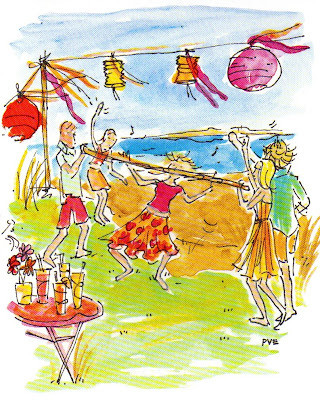 If you are "in limbo" about having a party, be inspired to have a little fun. Having a party is really so easy and in this rather glum economy, it will add a smile to your life as well as your friends and family. A party is a good "pick-me-up!" Firstly, select a date and a theme for your party. You do not need to have a specific reason to have a party. Compile a list of invitees and make or select a simple card for your invitations. Select 2 to 3 colors to build your party around. For example, if you select Pink, Orange and Red, then all items should work around those colors. Pink envelopes, Orange napkins, Red plates and festive paper lanterns with crepe paper streamers. 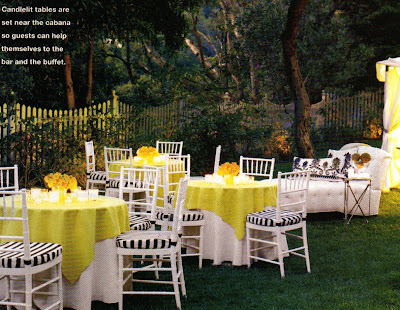 Using classics such as, white, black, navy also sets a chic base from which to build a party. Look for the clearance aisle at your local party store to see what fun and thrifty items might be found. Do not be afraid to look in the children's party section to add a fun and youthful vibe. Fun games for any age, such as pin the tail on the donkey, or limbo or even musical chairs break the ice when mixing new and old friends. Physical games such as badminton, volleyball and ping pong are also great exercise. Last year at our Family Reunion, we played a great game of volleyball. Once the invites are signed, sealed and delivered, start to write up your menu and make a master list. 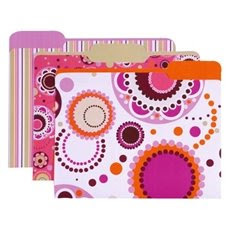 Take a simple file folder and use it to collect photos, ideas, recipes and anything that might inspire and excite you to ensure that your party is a success. Will you serve a special punch or what will your beverages be and scout for a local bartender or bartendress to serve drinks so that you can have fun too. You would be surprised, that for a nominal fee, there are people who will gladly work as your bartender or have a trusted friend do that task for you. In limbo about what you will wear, something casual or formal? Dressing up is often very welcome in this casual world. Specify on the invite or tell guests when they call to rsvp. You would be surprised at how many people get excited to wear "party attire." After all it is not every day that we get to play dress-up and play games. I just love weddings that require travel to destination spots, especially ones near a beach or a place that I have never been. Witnessing a love union and escaping for a weekend away, are always good for reviving love. The above illustration was done for a couple as a save the date card to advise guests where to stay and when the blessed event will take place. This week, my posts shall be dedicated to celebrations. Yesterday, while I was at the florist picking up long stem roses for my evening cocktail party, the florist was in the midst of so many things, preparing so many gorgeous arrangements for various events. She said we touch every celebration of life. I love that about my work too, I do touch many areas in my illustrations, from newborn announcements, birthdays, weddings, parties and more. Take time to celebrate, be it a destination one or right in your very own back yard. June is a time for embracing and celebrating summer. 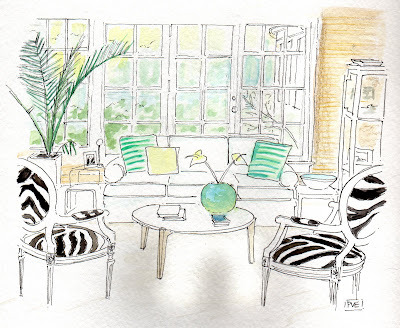 blink decor shows a glamourous sunroom awash in white, accents of turquoise and zebra. Windsor Smith chic zebra ottoman. Collection after collection, designers have long been fascinated with fur and skin. Animals are only natural and blend with all patterns, and every color scheme. Invite leopard, zebra or ostrich in to your home. 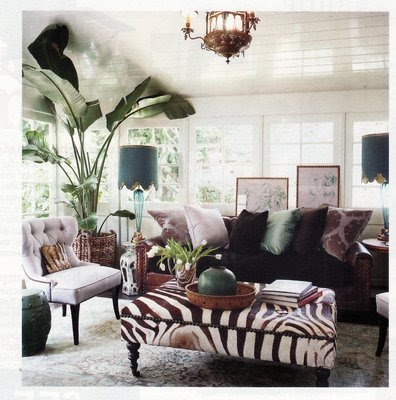 A zebra under foot from Anne Coyle, to count the stripes or 101 spots to recline on in home of Timothy Tew, one even Cruella de Ville would be envious of, all add a touch of the wild kingdom. 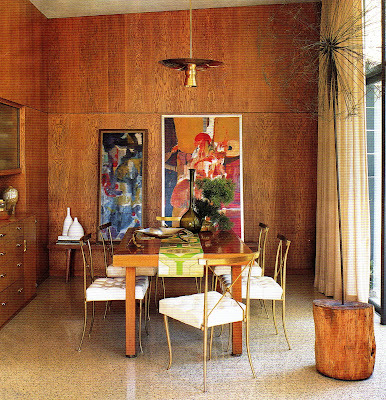 Photo below is from the book "Atlanta at home" by Frances Schultz posted over at Style Court. Currently, lizard and snake seem to be making a come-back in accessories. Sounds tempting, right! All you would need to add is a bowl full of apples, take a bite out of that, or not. After all, your home should be your very own garden of eden. 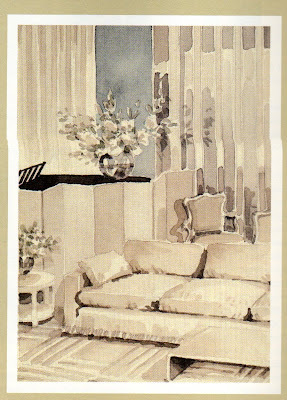 This is one magazine tear sheet that I have saved for years from ELLE Decor. 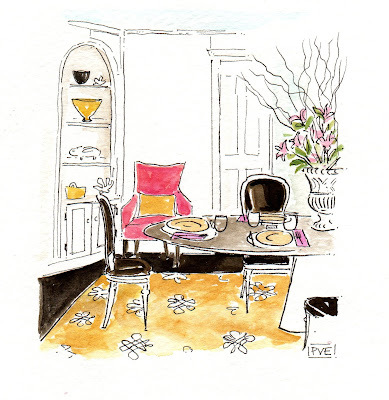 Home of Designer, Trina Turk - she dines here in this chic dining room full of fabulous finds. Vintage brass chairs by William Haines and a Herman Miller Table. The table runner is an antique Japanese obi. Note the bonsai tree. from an era gone by has far more appeal. The quality seems to far surpass some new things made today. Certain materials were ever popular, brass, various woods, white leather and created to make practical designs with form and function in mind. Also the allure of the hunt, the stories behind vintage along with learning about something old, makes me feel new. This is my home, my vintage home built in 1949. Everything has a story and was given, found, or bought from thrift, antique or consignment shop(s). 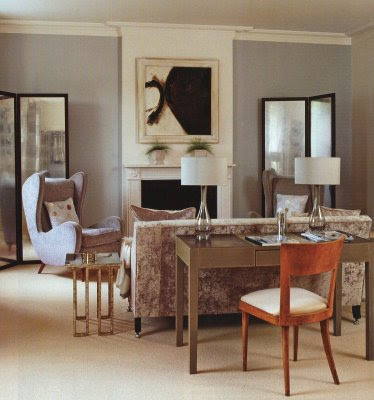 The only items that were purchased new are the lamps and the dining chairs -in order to find a matching set of eight. Light up your space or closet with something great from another era. 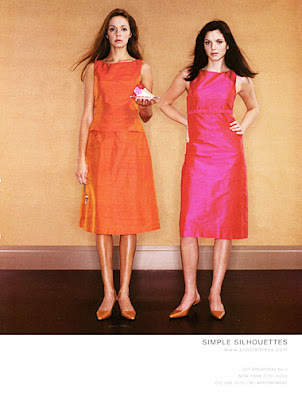 Collect vintage and you will see how quickly your finds will increase in value and in vogue. Do your homework on-line and start to look for your favorite vintage items. Do you have a favorite vintage purchase or item in your home. Does it have a story? 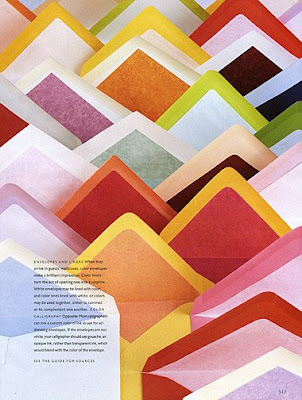 Designers design collections inspired by color. A collection may begin with a swatch of a beautiful color and then everything radiates from that color. Some of the most successful designers remain tried and true to color palettes that work season after season. 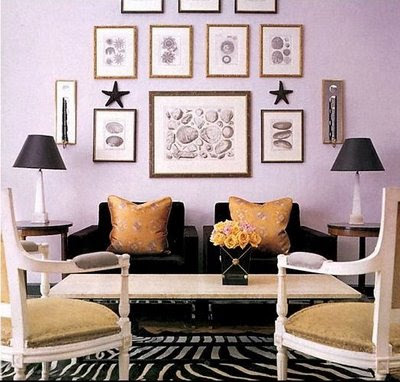 Most of us do find the color that works best for us and then infuse it with an accessory or accent piece. floor is bold and beautiful. I always say to clients when advising color, "most people go bold or beige." It is interesting to see bold colors against a beige backdrop or visa versa. 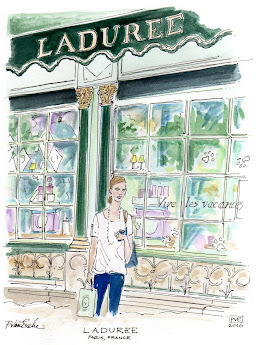 The above illustration was done for one confident lady at blink decor. She knows how to give things a fresh vibe. Everyone knows that Mrs.Blandings has a way with "buttah" yellow. Rich creamy yellows set the stage for an elegant setting. Yellows and golds remind one of the sun and have been said to dispel darkness while increasing joy and optimism. Wearing yellow can enhance articulation and verbal dexterity - words seem to flow easily when this color is in view. This explains Mrs.Blandings knack for flowing words in every post. Are you are golden girl, with the midas touch? What is the color that has your name on it. The above illustration was done for a client as a wedding gift. The home is painted a rich creamy yellow. The yellow looks like a ray of sun in this wintry setting. Warmest wishes to all you golden girls. Have you ever longed for glamourous legs like these? This gal, Minnie Mortimer looks so happy-go-leggy that I just had to post her. 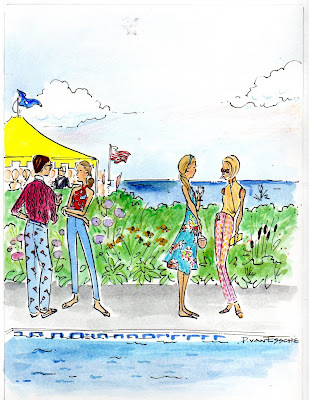 Habitually Chic posted about Minnie and her own line of fresh fashions, click here to see. Well - have you ever thought about bringing a great pair of legs into your home, I am talking about a perfectly poised table or chair. 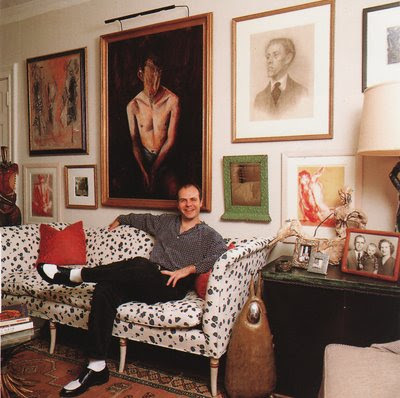 The photos below are from interior designer, Todd Romano Home. Lay down on the floor and take a look at the legs of your home. Will you take a look at these legs and the mixture of legs, from twiggy, to curved, to just freshly waxed with high gloss lacquer. It is as if these legs would be comfortable walking down any fashion runway. I love the mixture of the style and color of the legs. Each piece certainly stands alone but they seem to be quite pleased to be in such good company. I bet you will never think of legs the same way now. After all, it is summer. Time to show some leg. 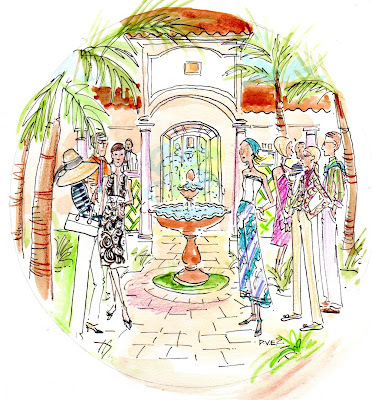 As promised, this week will be full of tips on bringing haute couture to your home. 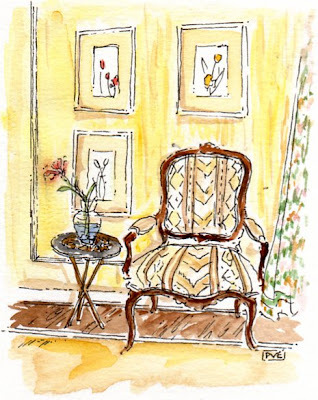 The above illustration by Mark Hampton, is of Syrie Maugham's own sitting room in Chelsea from the late twenties. 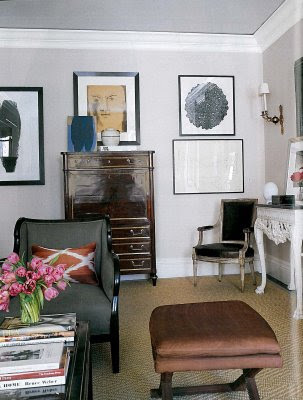 A salon of white and off-white interiors has the ability to look timeless and equally modern. Historically, white or white-washed interiors work well from simple cottages to luxurious palaces. Adding a simple white piece to a room adds a point of view. Take for example this sofa. Picture yourself relaxing on this sofa reading the latest French Fashion magazine, imagining that you are going to be called for your beauty appointment or fitting, right in your very own home salon. 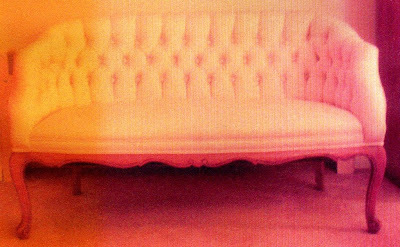 Every home needs a "salon de white sofa." 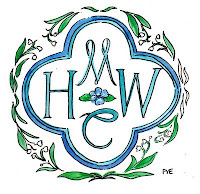 Please be sure to check out this site Haute-House and click on the fabric selections. Clever swatches appear in the shape of little birds. 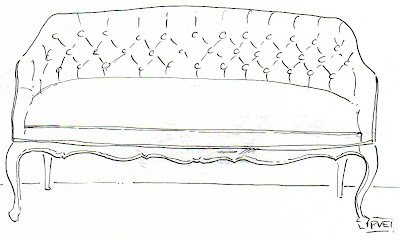 The above sofa is from Haute-House. 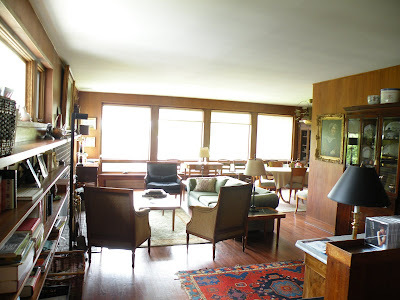 Last week while still on a mission of finding that sweet sofa that I had posted which I later found out that it was a seven grand, yes 7,000 dollars! Well, as the saying goes, when the going gets tough, the tough get going- so I visited a local thrift store and was delighted to find a wonderful sofa. I even did a drive by a local upholsterer who has covered numerous items for me and she said I must have paid at least $1,200 dollars. I got the steal of the century. This lovely love-seat was a mere $175 and is in excellent condition found at a local thrift shop named, Forever Elegant. Please excuse the bad photo, I was in a rush and my camera was not cooperating. I brought it home and it is in our bedroom. Mind you I do not have a salon but it does add a special touch of couture. Note the tufted back along with the great french legs. The best part is my husband loved it too. Here is my quick sketch! 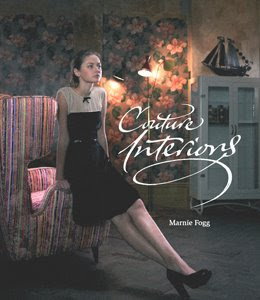 For those of you who love fashion and interiors, this is the perfect book to add to your collection. British publisher Laurence King, book by Marnie Fogg. 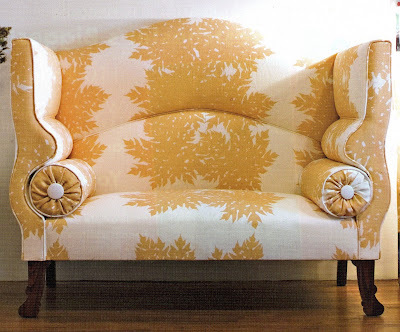 This book is on my wish list as I love couture touches in interiors. Recently, I have noticed a return to old world details in clothing that nod to the art of dressmaking and this is not just limited to fashion, it is flowing into the home. Details are as simple as contrast piping on a pillow, tiny bows, and tassels and soon your home will have the couture touch. Vintage resale stores often can provide the spark to create something with a fabulous find. I shall be posting on some fabulous finds and creative ways that you may add a touch of couture to your interior and you will soon feel elevated to the top of the class. My fascination with tender things began at a young age. Those of you who know me, know that I have a passion for paper, textiles and also for hand-me downs. Eco-friendly craftiness inspires many to use what we have collectively and to create from nothing to make something beautiful. As they say, birds of a feather flock together. Allow me to introduce you to one very inspiring woman who has a unique business. Barbara from Tender Threads, a tender-hearted woman that speaks deeply to my inner crafty goddess. I bet she whistles while she works. Her sweet sewing table and chair make me smile. She takes hand-me downs and makes them into heirloom memories. Her Quilts leave me tender-eyed. I have several my mother made for me, which I cherish and use. I cried when I saw these simply stunning creations. Her site and images will leave you tender-eyed, tears of joy for the hand-made! I love polka dot pants and buckets too. Prepare to cry, a good cry. Cry me a bucket! Beautiful Mary-Laure over at AUREA in Paris tagged me with the exact same round of tag that I had done not so long ago. In the spirit of sportsmanship, I agreed to play along, this time my dog "Bentley" will be my substitute tagger. After all, he does love a good game of fetch or a "ball" and he has never made it to my blog. Le petit-pauvre. I thought Mary-Laure's Benjy would enjoy it too. Bentley's birthday happens to be on Bastille day! He will be Three. 1. 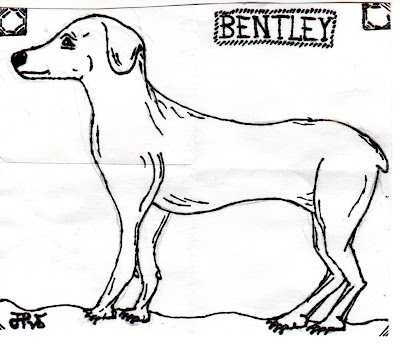 What was I (Bentley) doing ten years ago? 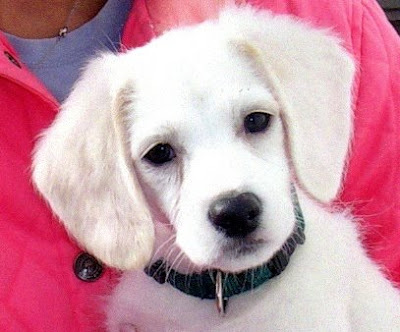 Well only three short years ago, a very kind family - four out of five visited me not once, but several times at the Pet Store, where I was residing along with some other dogs, and cool cats. The owners were kind, and gentle but I really was barking to get out and make a way for myself. I was only 5 pounds when this family held me. The store owner kept saying, "He is the perfect fit for your family" because I was quiet, kind and gentle. The family kept saying things like, "Please Mommy, can we get him, he is so cute!" 2. Five things on my to do list today. 4. Five things I would do if I were a Billionaire? I would buy my family a farm/ apres ski house in the country, I love wide open spaces to run. Certainly only natural to give a good bit to the ASPCA. Save some for a rainy day. A King Size bed and some Frette linen for all three of us. The Master, the Misses, and I. My home, right here with an upstairs bed in the kitchen and a downstairs bed too. 6. Six Peeps that I want to know more about? Exactly when is in my next meal? Anyone dog-gone willing to play ball? Someone just called my name for " food?" I never miss a meal. Yes, it is that time of year, time to remember Dad! Father's Day is this Sunday, always the third Sunday in June since 1910. What do you have planned for your Father, or your husband? I love preparing a fun day here for the Father of my children. We always make him some "cool" cards and do something nice for him! 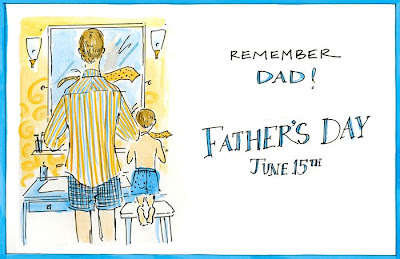 Take time to prepare a fun Father's day, because, if you have a son or daughter, you will want them to learn the importance of the tradition of honoring Dad! Someday they may be a Father or be a really great Uncle. Like Father, Like Son or Like Daughter. We all learn by example! 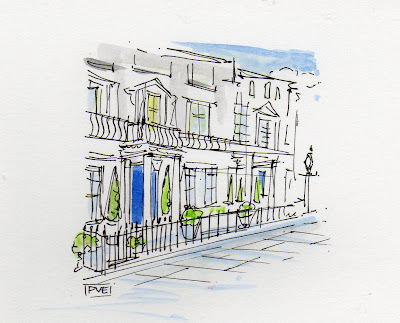 If I lived in "Notting Hill", I would want to live in a flat like this with a beautiful blue door. I would wake up and walk out my blue door door for a morning stroll with my dog to fetch a journal and a fresh english breakfast or a spot of tea. Greeting everyone along the way as if we all knew one another with a quip, "Cheerio." Lovely weather we're having! and below,hand painted masthead in cobalt blue links. As my Mother always says, remember to toot your own horn! My Notting Hill is a top of the hill blog, one that always takes the higher ground with an incredible view-point and a true passion for color, decor and strikingly chic accents for the home! Three Cheers to Michele! This living room decor nods to the mod. Limited in color but strong in form. The dark stained floors are a wonderful contrast for all the white furniture. The Silver chest, coffee table and end tables provide shine. The flokati rug and leather tufted mod seats add texture and a perfect setting for a chic cocktail party. Picture a pianist tickling the ivories, chic people mingling and drinking martinis served from silver trays and some tasty hors d'oeuvres. 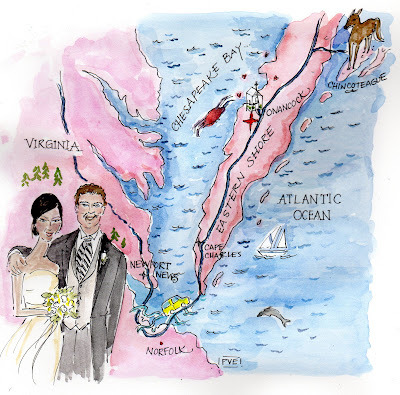 This illustration was done by special request for Connie over at blink decor. 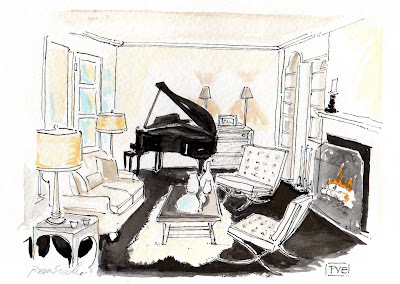 Connie has an eye for design and love of keeping the home flames burning brightly. Peruse the site for all your renovation and decor needs with the blink of an eye or click of a button. This room exudes calm and a tranquil spot to retire to. Although color is my vice, there comes a time for beige, a neutral palette to cleanse the mind & the soul. The past week, I was on a 5 day master cleanse of herbs and only fruits and veggies, the last 3 days consisted of magic potions. Veggie drinks, dandelion, celery, carrot, garlic, beet, ginger and they actually tasted amazing. My senses feel alive, the energy level is high and my skin feels super soft. My sense of smell, taste, sight, sound and touch all have been awakened. I would encourage anyone thinking about trying this to work with a holistic counselor or a Doctor to guide you through. The emotions will vary for each of us. It is important to follow a checklist to keep one on track and a journal to record events and emotions. Letting go of things that I thought I would not be able to live without, such as that freshly brewed coffee in the morning and the occasional glass of wine, all a distant memory and no cravings either. Limiting to just a natural diet or organic fruits and veggies is a wonderful way to bring about vibrancy and clear focus to a hectic life. My gratitude level for so many things has been heightened. I give thanks for my health counselor and yoga teacher. Click here to read about her, the fairest of them all. Being a parent provides a life with with lots of get up and go. Babies are a great way to connect, to develop circles and to make plans to see, to do and to go to. 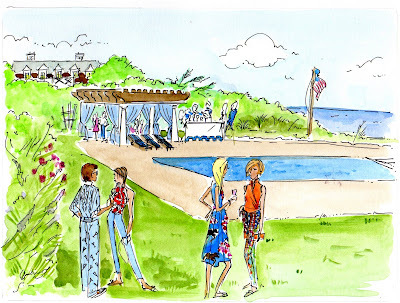 One site/blog that I was thrilled to contribute my illustrations to is here. I love connecting with clients across the pond. This one happens to be all the way in Glasgow, Scotland. Funny, "All the Best" blog lives there and was kind enough to make the introduction. Thank you Ronda! 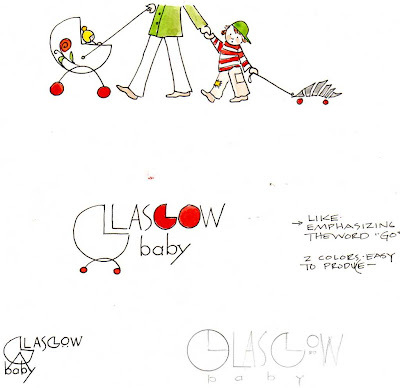 Please join me in wishing Glasgow Baby success and lots of get up and go with your site! A fun site to provide places to go to connect mums, dads, tots and babies all in Glasgow! I have always loved sunny things. The kind of things that make your day brighter, and bring a smile to your face. Yesterday, I found this sweet sofa that I am in love with, I would take two and put them face to face, both happy grinning little couchettes. They would be perfect in my studio for a spot of tea or a tall glass of lemonade. A hand-made sofa and you can find it here. My dog just mentioned how he it would be the perfect love sofa for him. Please allow me to introduce you to my lady-in-waiting. She was waiting here for us when we bought our home. The previous owners, he was a Doctor and she was an Artist. They built our home and she sculpted this stone lady. We placed her here and every day she waits for me. Look closely, inside her folded arm is a birdbath and often she allows the birds to find repose. She has been thoughtful, attentive and waiting to be repaired as she has weathered the seasons. Each morning, she reminds me to keep calm and then come evening, she bids me adieu. Does your garden have a lady-in-waiting? 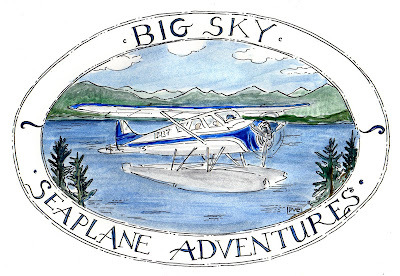 This logo was done for "Big Sky Seaplane Adventures" and was an artistic adventure for me to learn about seaplanes as well as the nature out west. I did many renditions before the final artwork was approved in order to get all the details just right. Tell me, do you have any summer adventures planned? 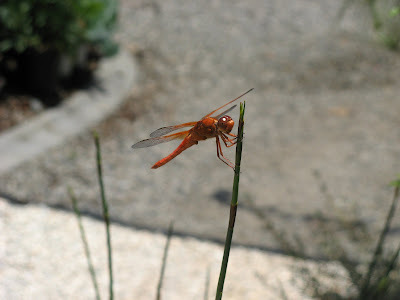 Summer dragonflies all aglow and orange, the above photo was sent to me by Fifi Flowers-after she saw my dragonfly painting below. I thought I would post it so that you could see how amazing they truly are in reality! 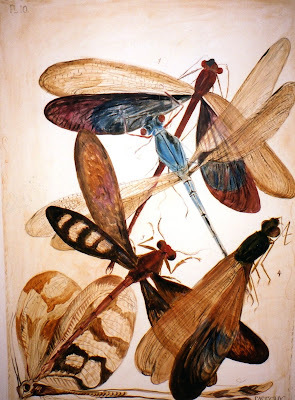 Years ago, I hand painted these dragonflies in a Victorian Kitchen. I still love these every time I see them. The wall that I painted them on is an angled wall that is under the stairs, so it was sort of like painting on a ceiling. My neck was a little soar days after but it is so worth it to see that they still are in flight. My client gave me an old french postcard for inspiration. I have also been fascinated with insects, butterflies and bees. Beauty for me takes flight in nature.